Hutchins, an Anglican day and boarding school for boys, is one of the oldest schools in Australia. It was established in 1846. 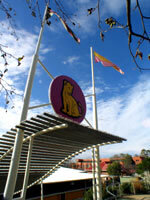 The school is next door to the main campus of the University of Tasmania, in the Hobart suburb of Sandy Bay. It looks out over the Derwent River from the slopes of Mt Nelson and is only five kilometres from the Hobart city centre. The staff to student ratio averages 1 to 12. More than 90% of Year 12 boys go on to university or other studies. Boarders, including many international students, stay at Burbury House, the on-campus residence, where there is 24-hour a day, seven days a week supervision and support. Classrooms are modern. There are three libraries, including the Senior School facility, Nettlefold Library, which has more than 30,000 books. Information and communications technology is integrated into all areas with approximately one computer for every three students. There are six dedicated computer laboratories and wireless access for laptops. Available activities include sailing, tennis, scuba diving, surfing, cricket, rowing, football, rugby, table tennis, badminton, hockey and water polo. Hutchins has two turf cricket wickets, four playing fields, a well-equipped gymnasium, a weight-training room, a static rowing tank, a heated 25-metre swimming pool and six tennis courts. The Hutchins School also has a sail-training boat that is used for programs on the Derwent River. The School’s Outdoor Education Centre is at Southport, 100 kilometres south of Hobart on the edge of the World Heritage Tasmanian South West Wilderness area. The amenities and cabins there form a base for camping, bushwalking, surfing, abseiling, snow camps, canoeing, beach activities and marine biology studies. Students with talents in music, drama and dance have access to facilities that include indoor and outdoor rehearsal and performance spaces, recording studios, state of the art lighting and sound equipment, sprung-floor dance and drama studios, and exhibition and reception areas.